NameRobot offers access to a database with over 6,000 first names, other kinds of names, and offers their meanings and origins. But how can that help you find a name? Example 1: You start a company with garden products, and so you enter flower into the first names tool and all names with flower as part of the meaning will be displayed. And maybe you will find a good idea for your company name in the results...? Example 2: A woman named Susan wants to open her own business. She enters her own first name in the first names tool and discovers that her name sounds exotic and exciting in a different language: she names her company "Shoshana" – which is the Hebrew version of her name. Enter a name or word and find its meaning or a corresponding name with just one click. 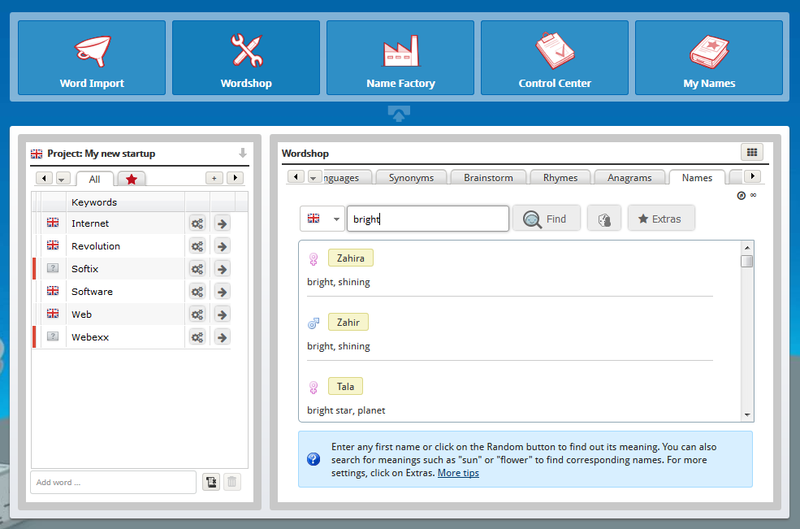 Go to the First Names tool in the Wordshop right now to test it out! If you don't have a NameRobot account yet, simply register and start looking for a name!